Recently multiple stories of migrants and refugees being stranded at sea or dying in the Bengal Bay and the Mediterranean Sea. In this essay, Stephanie Medley-Rath shows us how social class has always affected who lives and dies when accidents happen on the ocean. Sociologists argue that social class–or more accurately, socioeconomic status–can be a matter of life and death. Socioeconomic status is a measure of a person’s or household’s income (and wealth), education, and occupation. Socioeconomic status is correlated with health outcomes (overall health, cigarette smoking, and unhealthy behaviors), education outcomes (SAT scores, college graduation, and undermatching), and even marital outcomes (getting married in the first place and staying married). Let’s explore this a bit more by examining the influence of socioeconomic status (or SES) on maritime travel. In 1912, the Titanic hit an iceberg and sank. The ship only had enough lifeboats to accomodate slightly more than half of the number of passengers and crew onboard. Approximately one-third of the passengers and crew survived the sinking. Survival, however, was not left purely to chance. 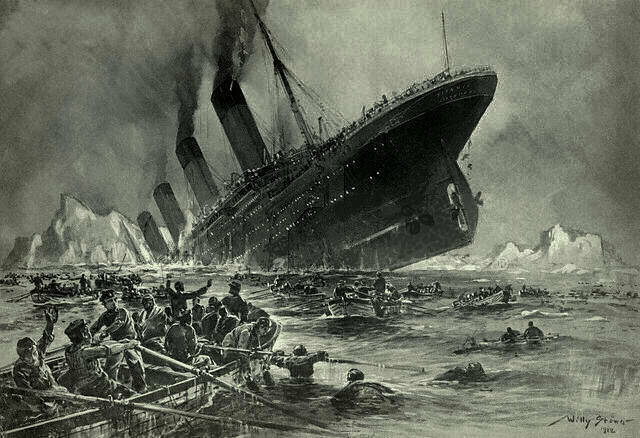 A person’s likelihood of suriving the sinking was correlated with social class. Of the 324 first class passengers, 201 survived (62.35%). Of the 277, second class passengers, 118 survived (42.45%). Of the 708 third class passengers, 181 survived (25.56%). In short, the wealthiest had a greater chance of surviving compared to the poorest on the ship (see Titanic Fast Facts). Well, it depends. At this point, it might be better to move to a more modern use of socioeconomic status and think in terms of Max Weber: power, property, and prestige. Consider the following examples. Migrants and refugees are boarding smuggling ships from Northern Africa to Southern Europe seeking economic opportunity and protection from persecution. Between January 1 and April 26, 2015, approximately 27,722 migrants attempted to cross the Mediterranean Sea and 1,721 died (6.21%). The European Union (EU) improved their efforts at search and rescue at the end of April by tripling funding of Operation Triton. Between April 27 and June 29, 2015, approximately 42,297 attempted to cross the Mediterranean and only 99 died (0.23%) (see Revealed: ‘Dramatic’ Fall in Mediterranean Migrant Deaths). In short, this crossing was deadlier without increased intervention from the EU. A migrant boat with Rohingya Muslims from Burma (Myanmar) and Bangladeshis was blocked from coming ashore for a week in May 2015 until Indonesia and Malaysia offered limited humanitarian assistance (see Indonesia, Malaysia Agree to Help…). The United Nations estimates that at least 25,000 migrants have attempted the journey with 300 dying (1.2%). Importantly, whole sinking ships are excluded from the mortality estimates, therefore mortality rates could be higher (see Thousands of Migrants Stranded at Sea). Now let’s compare migrant boat crossings to cruise ship journeys. Between 1980 and 2012, 16 cruise ships have sunk. The Costa Concordia partially sank in Italy in 2012 and 32 people died. Most cruise ship sinkings do not result in the loss of life and are relatively safe. I could book a 4-day cruise from Tampa, FL to Cozumel, Mexico for less than $1,000. One of the men from the South Asian boat adrift at sea indicated he paid $2,500 for his journey. He paid 2.5 times to be adrift at sea compared to what an American could pay for a fun-filled cruise. I can only assume a Caribbean cruise is fun-filled because I have never been on one and trust that most do not result in being stranded at sea. Socioeconomic status impacts one’s experience with boat transportation, but does not tell us everything. That’s why I mentioned Weber’s three p’s: power, property, and prestige. Passage through the Bengal Bay is more expensive than a Caribbean cruise. This suggest the role that property plays in securing passage on either type of boat. A Caribbean cruise is a source of prestige compared to a ride aboard a smuggler’s ship (though I could be incorrect as I have zero personal experience with smuggler’s ships). Moreover, this is a story of power: who has it and who does not. Who has the power to leave their home on a cruise ship as opposed to a smuggler’s ship and who does not? Today sociologists measure socioeconomic status by combining a person’s income/wealth, education, and occupational prestige. Max Weber, a sociologist from the late 1800s, argued that socioeconomic status hinged on a person’s power, property, and prestige. What are the similarities and differences between the modern formulation of SES is to Weber’s? The author indicates that socioeconomic status is correlated with health, education, and marriage. What else is likely correlated with socioeconomic status? Give one example of another social phenomena correlated with socioeconomic status and explain the correlation. Have you ever been on a boat? What kind of boat(s)? What was the purpose of your boat ride(s)? How is SES related to the type of boat(s) you have been on and the purpose of the boat(s)? What social class differences could we expect between the travelers on a cruise ship and the people who work on the ship preparing food, cleaning rooms, and doing other forms of support work?